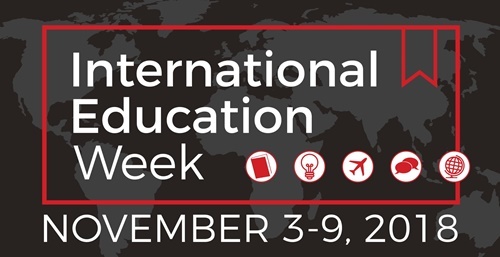 WKU will celebrate International Education Week (IEW) November 3-9 with a robust calendar of nearly twenty co-curricular events and enhanced courses. A joint initiative from the U.S. Departments of Education and State, IEW is celebrated worldwide with a broad aim of highlighting the benefits of international education and exchange around the globe. With the input of faculty and staff, WKU tailored this objective to better serve its distinct internationalization goals: that of providing programs that encourage the WKU community to engage with diverse cultures, participate in an intercultural dialogue, and learn about internationalization resources and opportunities. This is done both inside and outside the classroom, with a combination of Dialogue Series sessions and co-curricular events. ENG 299: Exit West, Ted Hovet (Nov 6, 10:00am, CH 125). Students will present a dialogue on Mohsin Hamid’s novel Exit West. MGT 417/MGT 361: Cultural Communication, Aquesha Daniels and Mariah Yates (Nov 6, 11:10am, GH238/GH240). Students will participate in a cultural communication simulation. CHIN 401: Language Study, Ke Peng (Nov 7, 11:30am, GRH 3011). Students will dialogue about how language study provides a greater understanding of a culture’s attitudes and values. A full list of sessions may be found here. The IEW calendar also includes a host of events outside the Dialogue Series. The majority of these events are free and open to the public. Two of WKU’s primary international education initiatives overlap during this year’s IEW, with two events featuring Cuba, the 2018-19 International Year Of… country of focus. Both events offer experiential learning opportunities in the form of a Cuban salsa workshop and Taste of Cuba, a culinary event at San Juan Smokehouse. “International Education Week provides our students with an incredibly valuable opportunity to experience international culture and to think about the importance and impact for business organizations. This event offers a glimpse into Cuban culture, cuisine, dining, and professional etiquette,” says Evelyn Thrasher (Associate Professor of Information Systems), who conceptualized and planned the Taste of Cuba event with John Dizgun (Executive Director, Kentucky Institute of International Studies). storySLAM: Serendipity (Nov 3, 5:00pm, Spencer’s Coffee). Students will share a five minute story about their most serendipitous moments abroad, such as discoveries, fortuitous encounters, or hilarious coincidences. The audience will vote for who told the best story and the winner will receive a prize. Careers in International Affairs and Service (Nov 5, 7:00pm, HCIC 2001). OSD will host a student panel about internships, scholarships, and other opportunities for students interested in international affairs careers. Coming to America: A Deliberative Dialogue on Immigration (Nov 8, 4:00pm, HCIC 1011). Through the deliberative dialogue process, participants will examine facts on immigration, explore future considerations, and determine potential next steps for immigration policy. Registration required. A Taste of Cuba (Nov 8, 5:30pm, San Juan Smokehouse). Participants will enjoy an authentic Cuban meal and learn about dining, etiquette, and professionalism in Cuban culture. Cost is $35 (student scholarships available) and registration is required; registration details available at wku.edu/oip/iew. A complete calendar may be found here. To learn more about IEW and the Dialogue Series or to work with OIP on other international activities next week, contact internationalization@wku.edu. About the Office of International Programs: The Office of International Programs supports the internationalization agenda of the university by creating opportunities for faculty and staff development in a global context and supporting the development of meaningful co-curricular programming for student, campus, and community audiences. Contact: Lauren Reyes, (270) 745 3975.